Before I became a bony, arrogant, and selfish teenage snob, I was a shy, chubby bookworm with a crew cut, thick glasses, and a sense of modesty that bordered on the nutty — I wouldn’t even let bare ankles show between pants and shoes. My prepubescent self was inhibited and stubborn, but also kinder than the "Teen-to-Come" — I would actually do things to please others. My father loved fishing and wanted me to love it too, so I humored him and always said "yes" when he asked me to go on fishing trips. I didn’t like handling the smelly crabmeat bait or seeing and hearing fish struggle after being caught, or getting seasick as monstrous swells would almost capsize the boat, but I enjoyed the fragrant sea breezes, the warm sun, the boat rides, navigating around old buoys and isolated lighthouses, seeing the herons, hawks and ducks that flew near us. Today, I live far from those fishing grounds and the only boats I ride are ferries, but when I smell Montale’s Blue Amber fragrance I am reminded of those childhood fishing trips by an olfactory jolt — a jolt that conjures a time, a place, even a "self" that disappeared long ago. Blue Amber includes notes of bergamot, Bourbon geranium, patchouli, coriander, vetiver, vanilla and amber. I can discern each of those notes during the life of the scent, but when those notes begin to bounce off each other, dissipate, flare up, and meld, I smell things decidedly un-perfume-like — a brief hint of fuel and exhaust fumes, the chemical smell of mosquito repellant. I also detect a sharp 'dry cloth' scent, redolent of the stiff, heavy waxed-cotton jackets and caps my father and I wore on our boat; they smelled, not unpleasantly, of sun-baked salt — salt from the sea, salt from sweat. At the very end of Blue Amber’s development I smell a soft, summery sea breeze, lightly (and sweetly) scented with dried reeds. Most people I’ve let sample Blue Amber do not like it after the initial strong amber blast begins to fade — and if you don’t have a fondness for the scents of outboard motors, bug repellant and the sea, you may not appreciate it either. Blue Amber is sold on the Montale website as a scent for women and I strongly disagree with that categorization; this is a unisex fragrance. The lasting power of the Eau de Parfum is excellent. Nostalgia is free but I’m happy to add a "scent-track" to pleasant memories. For buying information, see the listing for Montale under Perfume Houses. How lovely a thing memory is. I thank you for sharing that moment w/ me- I could almost taste it. I am not sure what I'd feel about the scent, what with the sea and everything, I love, love your review! Thank you. This seems like a scent more fascinating to smell, than to comfortably be worn–at least, for myself. Obviously “comfort” has a unique meaning to you–and everyone, for that matter…and you seem to find it in this scent. Your trip down memory lane reminded me of my own numerous childhood fishing trips with my father and brother in the Pacific Northwest. The smell of gasoline, the pungent fishy odors — aah. I'm fairly certain I don't want to wear these scents. Nonetheless, I need to sniff Blue Amber. 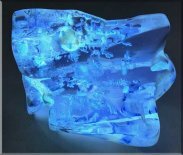 NLB: I don't want to scare people away from Blue Amber! Do give it a try if you come across it. Thank you so much for noticing! It is fixed now.